This week we chatted with the head of US software company Nitro – and he didn’t hold back. WHEN ASKED HIS opinion on Ireland’s grab-bag of low taxes and other sweeteners for tech companies, the founder of fast-growing outfit Nitro doesn’t hold back. “The reason that the big guys came here was tax and incentives and subsidies and all that stuff, there’s no f*cking doubt about it,” company CEO Sam Chandler told TheJournal.ie. The software company boss was in Dublin this week to inspect the company’s new office in Mercer Street Lower, where there is enough space to more than double its local workforce of 50. He expects to hit that capacity in a little over the year. And the Australian, who started the software company in Melbourne at the age of 23, before later moving its headquarters to San Francisco, is an unabashed fan of the capital. “I would describe Dublin, in terms of the technology talent ecosystem, as the closest thing to Silicon Valley outside of Silicon Valley, because you’ve had this constant tradition of all the Silicon Valley (companies),” he said. 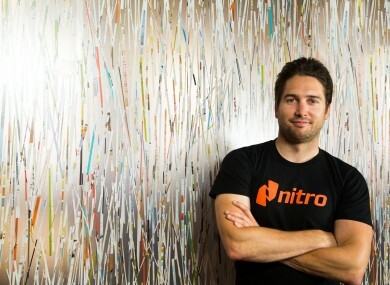 Nitro was one of the first of a new crop of smaller, fast-growing foreign tech companies to set up shop in the city when it opened its EMEA (Europe, Middle East and Africa) base about 18 months ago. While its the local operation began as effectively a regional call centre – providing sales and customer service – Chandler said the quality of staff available meant it was doing an ever-increasing amount of product development in Ireland as well. Its EMEA office head is Cork native and former Salesforce vice president John O’Keeffe, while its San Francisco-based global operations chief, Gina O’Reilly, was born in Belfast, raised in Cavan and graduated from DCU. The company is the main challenger to Adobe in the electronic-documents business with revenue of more than $30 million (€26.7 million) last year. It counts the European Parliament among its 500,000-odd customers. Most of the work on its new flagship product, Nitro Cloud, was being done in Ireland, although its most cutting-edge research – for products that used things like ”sentiment analysis” to allow computers to read documents like humans – was still done in the US. But despite the finger-pointing from both the US and Europe about Ireland’s tax regime, which has helped multinationals trim their corporate tax bills to the low single digits, Chandler said that was low on the list of reasons for establishing a base here. He said any tax benefits for Nitro were “several years out, at least” as it was focussed on expansion, rather than delivering profits, after raising $15 million (€13.4 million) in November. However he said it was only because Ireland had earlier attracted the likes of Apple and Google with incentives during “phase one” of the country’s development that it was now able to boast such an enviable tech sector. The second phase of the development had already arrived with next-generation companies like Nitro, Slack and Uber, the so-called “gazelles” that created large numbers of jobs as they ramped up their operations. The only piece yet to fall into place, according to Chandler, was the third phase: a thriving domestic startup scene, where there was a constant stream of local entrepreneurs building businesses of international scale. Email “Why this tech CEO says low tax deals were the 'best thing in the history of the Irish economy'”. Feedback on “Why this tech CEO says low tax deals were the 'best thing in the history of the Irish economy'”.